A bunny in Davenport, Iowa got his Sundays mixed up. A week after Easter, an adventurous critter showed up to Bark in the Park Day at Modern Woodmen Park. During the second inning of Class A Clinton's 5-4 win over Quad Cities, the hare hopped its way onto the field causing the game to be delayed. "I've never seen anything like it," said Ronnie Dawson, who was in the outfield when the long-eared mammal stormed the field. "I figured something happened, like the pitcher called time or the catcher wanted to go to the mound, but all of a sudden I see the rabbit on the field. So that was pretty funny." As soon as Dawson realized the source of the delay, he prepared himself for more four-legged field invaders. "Once I saw the rabbit, I thought we were going to see a bunch of dogs get onto the field to chase the rabbit. I was hoping none of my teammates were afraid of dogs," the Astros No. 19 prospect joked. Animal interruptions are nothing new for Quad Cities. In July 2014, an opossum ambled onto the field and caused a delay as it traipsed around the diamond. 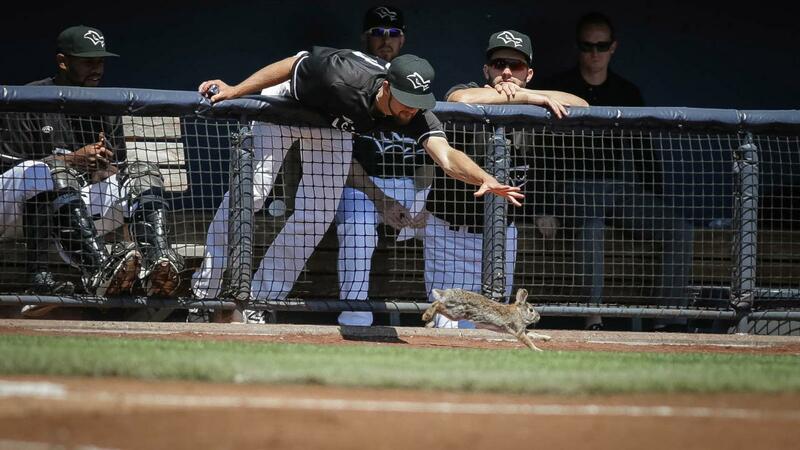 The rabbit brought good luck to Dawson, who hit a solo homer in the sixth and reached base four times. "I was the only lefty in the lineup, so I wasn't sure how they were going to attack me," he said. "I was seeing the ball well, and on the home run, I got a first-pitch changeup. It was up so I was able to get a good swing on it." The 2016 second-round pick is hitting .220 with a pair of home runs and seven RBIs through his first 16 games at Class A. Right before the rabbit stole the show, Clinton's Nick Zammarelli and Luis Rengifo hit back-to-back jacks to begin the second.